Lesley Pymm reports: We travelled down to Devon on the Friday, and I have to admit that warnings against travel had totally passed me by. Anyway we had a good journey and settled in to our apartment overlooking the beach at Seaton, where there was a view of much of the course I would be running. I had joked with Mike that he need not even leave the warmth of the apartment. I had only entered the Cub Run this year (9 miles) – you are able to upgrade to the longer run (20 miles) and I had hoped to be able to do this. I have run the full Grizzly 19 times and the cub once – when I was running with a broken jaw. I find that it is getting more and more difficult to train for it as I get older as there are so many XC races in January and February, which I want to do, and I can’t get the longer runs in. I seem to take longer to recover than I did when I was younger. 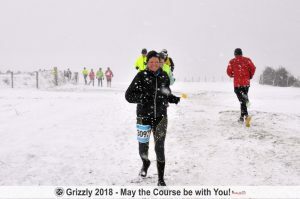 Having fallen down the stairs a couple of weeks prior to the Grizzly this year, and ended up on crutches for a few days and then struggling after that, there was no question of changing to the Grizzly – I was going to have to work hard just to get round the cub. Anyway, Saturday morning started with a drive to Killerton parkrun. This meant going through some floods on the road and I only just got to the start in time. A bit of a warm up from the loos to the start (uphill) and then we were off. It was a lovely run, but very exposed on the hills and quite cold. Friendly and, although I didn’t stop for the cafe, I did stop at the Farmers Market held there and stocked up with bits and pieces. When I got back to Seaton, Mike and I walked up to the Race HQ and bumped into Carol Austin who many will remember from Cannon Hill parkrun before she and Lesley moved to Seaton and started a parkrun there. She is also very involved with Axe Valley Runners in the arrangements for the Grizzly. I told Carol that I was only doing the Cub and her reply was that ‘everyone is’. They had cancelled the full run owing to the weather and were doing a variation of the Cub that would not take in the infamous Stairway to Heaven. She said that some of the runners from Birmingham had not been able to make the journey owing to the state of the roads. I was so pleased that I had decided to come down early for a spot of parkrun tourism. We then went back to the apartment where we had a brilliant view of the children’s races and we were able to shout them on from the warmth and comfort of indoors. The snow had started and it was not pleasant for them. Sunday morning arrived and I looked out with trepidation at the snow that covered the beach and the hills in the distance. This was going to be fun. I had taken my fell running pack with me, but ended up not carrying it as I was wearing everything. 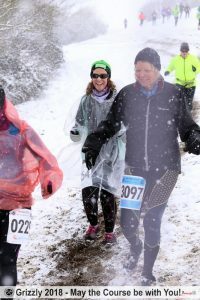 The only time I have worn more to run was when I did the Polar Circle Half Marathon in Greenland. The Race Director, Tony, gave a very good briefing where he made it clear that this event was about keeping safe. As far as he was concerned, if the first person back had only gone up the road and then decided it was too much for them, that was fine and they were the first to finish. He asked that everyone looked out for everyone else and that we all stayed safe. Then we were off. We ran up hill out of Beer and through the caravan site – I decided to miss the beer tent at this stage in the run although many runners did partake in some Grizzly Ale. I had been getting quite warm and wondered if I should take something off and shove it in a pocket, when we climbed onto more exposed land and I was very glad of my layers. The front runners came past us going the other way, they were amazing! Although we had been promised that we would be going on the beach at Branscombe, it was clear that the marshals had decided that this was not safe. I think the front runners got to do it, but the hill was becoming too slippery so, by the time I got there, we were directed along a field and then we climbed up to the top of the cliff. This involved more steps than the Stairway to Heaven – not my favorite and worse with my knee still grotty. Anyway, it was slippery and everyone was reduced to queuing up and having a chat. We were all really enjoying it. Someone commented that there were probably loads of people who would not even go out of the house on a day like this! At the top it was incredibly windy and really hard to move, the marshals were absolutely brilliant. All the way round they were so cheerful and encouraging. I did stop at the beer tent this time as I only had a couple of miles to go. Back into Beer and then along the cliff path to the edge of Seaton where we had to go on the road again to the last bit through gardens to finish on the Esplanade. I made it 8.8 miles that I had run. It was absolutely the right decision to cancel the main run. It was hard going to just run as far as I did. I took about 2hrs 30mins and was not last. That was quite long enough for marshals to be out in it and for runners too! Axe Valley Runners have once again put on a great event and made sure that we were all safe. Mike and I walked over to the Fountain Head pub and back the following day – about 11.5 miles over much of the course – and it was so much harder than it had been on race day. The snow was drifting and it was very windy. I struggled to stand and to move at times. I think they would have had to cancel the whole thing had it been like that on race day. Unlike last time I did the Cub, I am wearing my T-shirt with pride this year.